updated Some of the changes being rolled out on the BBC's Red Button digital text service on Freeview this month have been reversed. 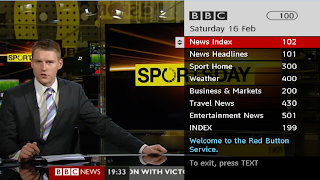 BBC News pages, including regional news and business plus BBC Sport pages have reverted back to the old menu structure, which is based on the old Ceefax infrastructure. Additionally, the quarter-screen format on news articles has returned. Last week's removal of the quarter-screen video screen divided opinion among regular users of the text service. There had been reports on internet forums that certain Freeview boxes were having difficulties using the revamped service.On their blog, the BBC's Sorcha Clifford stated: "We’re aware of some isolated issues with specific set-top boxes failing to load parts of the service on Freeview. The Red Button team are trying to replicate it on their own representative sample of set-top boxes, working to identify the problem and fix it." The service on Freesat has not been affected, and the recent changes to the format, including the introduction of full-screen news articles remains in tact on the free-to-air satellite platform. In the past some Freeview receivers have suffered from changes to teletext services due to the more relaxed specifications used by digital terrestrial TV receivers and advances in technology. Early Freeview boxes suffered when the former Teletext service on ITV and Channel 4 switched to using regular page numbers, and some users had trouble with the implementation of the BBC News Multiscreen when it was carried on Freeview.